The EdgeRouter X delivers cost-effective routing performance in an ultra-compact form factor. 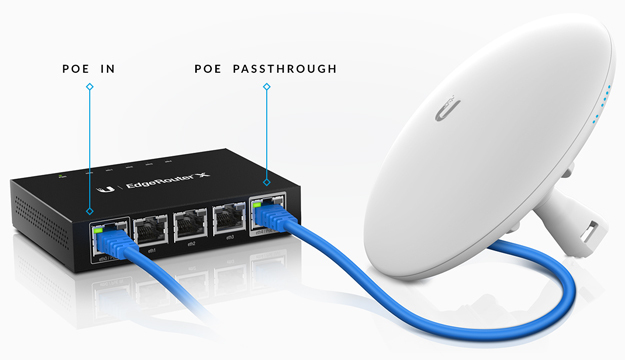 The Ubiquiti ER-X accepts PoE input and features a passive PoE passthrough option to power an airMAX device, The ER-X provide five independent, Gigabit RJ45 ports that are configurable for switching. The intuitive, graphical user interface is easy to learn and makes routing features simple to configure and monitor. It includes an integrated Command-Line Interface (CLI) for convenient access to advanced functions. Powered by 24V passive PoE or a power adapter, the EdgeRouter™ X features a passive PoE passthrough option* to power an airMAX® device. 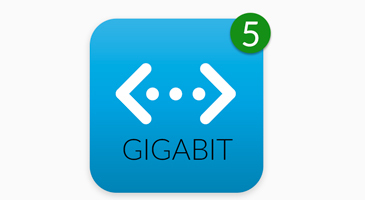 The EdgeRouter X provides five independent, Gigabit RJ45 ports that are configurable for switching.